I have a vivid childhood memory of eating Rhubarb Custard Pie at my grandma’s house. I was probably four or five years old. Grandma asked me what kind of pie I wanted for dessert, and I picked rhubarb custard. It may have been the first time that I ever tried this particular pie. I’m not sure. What I do know is that from then on it was my favorite pie. Last year I made Rhubarb Custard Bars and posted about my unsuccessful attempt to re-create the pie that I remember my grandma making. After posting that bar recipe, we found my grandma’s cookbook which contains a recipe for Rhubarb Custard Pie. Since she made so many recipes out of her cookbook, I hoped that this was the pie recipe she used. 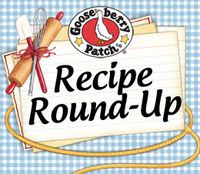 I have been patiently waiting for my rhubarb to be ready so I could give this recipe a try. I do believe this is the recipe she used. The nutmeg and the tart rhubarb combined with the sweet and creamy custard are exactly the flavors that I fondly remember in my grandma’s pie. My crust was not perfect like grandma’s, but it was good enough. It was wonderful to reminisce and enjoy this pie again. The rhubarb custard pie my grandma used to make. A sweet and creamy nutmeg-flavored custard forms around the tart rhubarb. 1. For crust, combine flour and salt in mixing bowl; cut in shortening using pastry blender.2. Sprinkle with water and gather dough dough into a ball; divide dough about in half, using the larger portion for the bottom crust.3. Roll out larger portion on lightly floured surface; transfer to 9" pie pan and gently press to fit pan.4. Roll out smaller portion and cut into strips; on waxed paper, weave into lattice or wagon wheel top.5. Prepare filling by combining eggs and milk.6. Mix together sugar, flour, and nutmeg; stir into egg mixture.7. Mix in rhubarb; dot filling with butter.8. Transfer top crust over the top of the filling and seal edges to the bottom crust; cover edges of pie crust with aluminum foil to prevent over-browning. 9. Bake in a 400°F oven for 50 to 60 minutes.10. Cool and serve; refrigerate leftovers. I don't think I have ever had rhubarb custard pie but I am convinced just by the looks that it is marvelous! Yesterday, I was looking at strawberry rhubarb custard pie in youtube. Yours looks delicious. Sure I need to try them. What a wonderful flavor combination, and I love the pinwheel design on your pie! I'm so glad you found your treasured recipe that your grandma used to make! We love custard pies! I have never tried is with rhubarb but it sounds delish! I can vouche for this pie being one of the BEST in the world! This is the recipe my family has used for 50 years and it is everyones FAVORITE!! 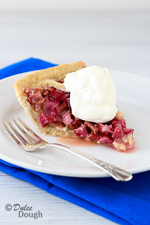 Even people who think they don't like rhubarb are in love with this pie! It is THE BEST! Your rhubarb custard pie looks divine. I like your pinwheel design on top. I'm so glad that your were find your Grandma's cookbook, such a keepsake. This looks delicious. I love using recipes that have come down through the generations. I've never tried rhubarb pie, but I would try your recipe. It looks amazingly delicious. I found my mom's recipe for rhubarb custard pie today and just finished making it. It's exactly like your mom's! It didn't look like there was enough custard at first but after it sat in the pie crust for a few minutes the custard was up to the top. I have fond memories of this pie, too!